Christmas songs that do not mention Christmas? Several of the very best 'Christmas songs' make no specific reference to the festival itself. Let it Snow, Marshmallow World, Winter Wonderland and Sleigh Ride are idyllic evocations of winter in the north-east of the USA. 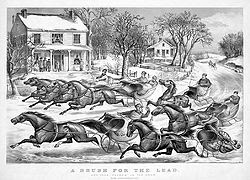 Jingle Bells (1857) was originally written for Thanksgiving under the name 'One Horse Open Sleigh'. The sleigh/Santa Clause association was planted in the public imagination and underlined by the more familiar title. Now the sound of jingling in the opening bar is one of the best known sonic symbols of Christmas. Sleigh Ride is another magnificent example of this subtle process. It seems to have been with us forever but Leroy Anderson wrote the music during a heatwave in 1946 (Iriving Berlin was similarly inspired for White Christmas). The original version was an instrumental. Mitchell Parish added his lyric in 1950 - and for me it ranks alongside his other masterpiece, Stardust. Sleigh Ride is now amongst the top ten most played pieces Christmas song across the world - and the most popular according to ASCAP survey of 2010. Sleigh Ride also a staple of most primary school Christmas concerts - mercifully the lyrical subtleties of I Wish It Would be Christmas Every Day remains confined to shopping malls and office Christmas parties.